National Machinery Exchange specializes in coil processing equipment. 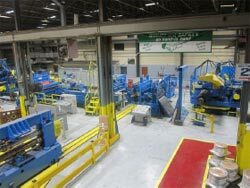 We handle cut-to-length lines, slitting lines, coil banding lines, tension leveling lines, traverse winding lines, oscillating slitting lines, galvanizing and galvalume lines, coil coating lines, annealing lines, pickling lines strip cleaning lines, and all coil processing support equipment uncoilers/recoilers, upenders/down enders, slitting heads, tension stands, turnstiles, scrap choppers and scrap winders, coil cars, and strip end welder equipment. Contact us with all your coil processing machinery needs.